Richard Blumenthal's lead in the U.S. Senate race over Linda McMahon has evaporated to within the survey's margin of error, according to the Quinnipiac University poll released on Tuesday morning. Blumenthal, the Democratic attorney general, has a 49 percent to 46 percent lead over the Republican former CEO of World Wrestling Entertainment. Because the survey of 1,083 likely voters has a sampling margin of error of plus or minus 3 percentage points, the candidates are virtually neck-and-neck. 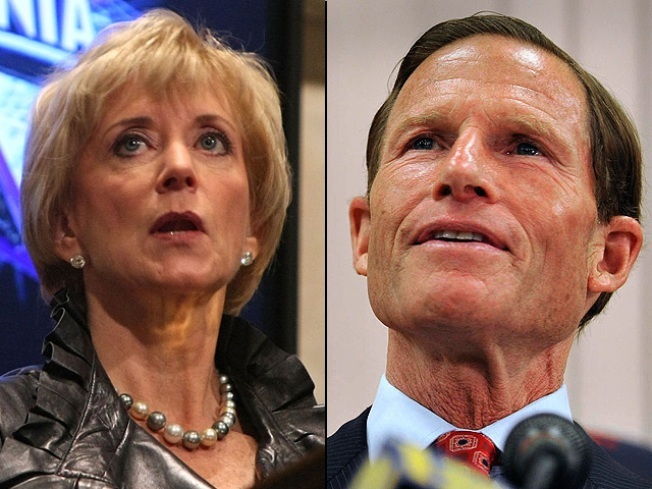 “Blumenthal has to be concerned about Linda McMahon's momentum. He can hear her footsteps as she closes in on him," Quinnipiac University Poll Director Douglas Schwartz said. Schwartz said McMahon’s numbers are boosted by voters’ anger with government but there is a nationwide gender gap in voting, with most women voting Democrat and men siding with Republicans. He also said debates could be important in this general election. Blumenthal's lead in the poll two weeks ago was 6 percentage points. In a different poll of registered voters in March, Blumenthal's lead was 33 points. Poll Director Douglas Schwartz calls Blumenthal's lead "statistically insignificant" and says he should be concerned about McMahon's momentum.